Can the L4 Nerve Cause Groin Pain and Limping When Walking? Your spinal cord is the long bundle of nervous tissue and bones that relay messages between your brain and body. Nearly all muscular movement in the body is facilitated by these messages carried by the nerve cells. A severe injury to the spinal cord can therefore greatly hamper movement or prevent it altogether. In the lower body, it may prevent walking, swimming and all other types of movements performed with the legs. 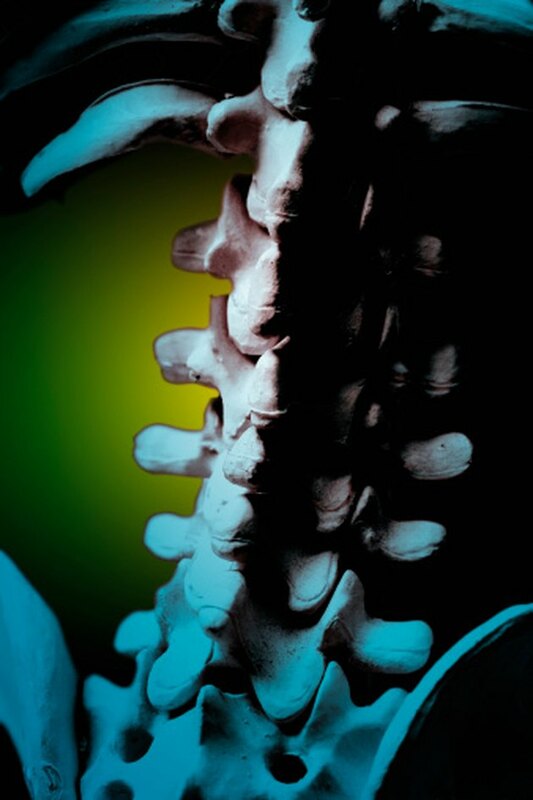 An injury to the spinal cord is caused by severe trauma in the back or head. Causes include an electric shock, bullet or stab wound, a severe twist in the middle of the body, a driving accident, a fall from a great height, a sports injury to the head and just about any other kind of extreme force or direct trauma. If an injury to the spinal cord is severe enough, then the person will need to be immediately immobilized. The spinal cord contains several basic segments: the cervical spinal nerves, thoracic spinal nerves, lumbar spinal nerves and, the smallest part, the sacral spinal nerves. Each segment controls a part of the body to which it corresponds. For example, the fourth lumbar nerves, known as the L4 nerves, control many of the muscles in the lower body, including parts of the femoris and glutes. They are some of the lowest nerves in the spinal cord. Only a single lumbar nerve and the five sacral nerves fall below them. An injury to the L4 nerves affects some hip, knee and foot movement, depending upon the level of the injury. Injuries only sometimes occur in isolation, so trauma to the surrounding lumbar and sacral spinal nerves may accompany an injury to the L4 nerves. The L4 nerves in particular correspond to muscles surrounding the groin, so an L4 injury will often cause pain concentrated in that area of the body. Another phenomenon that can cause serious health concerns is the effects upon the sciatic nerve, which, as the longest nerve in the human body, runs from the back all the way down to the leg. A bulging or herniated disk that ruptures can pinch the sciatic nerve and send pain all the way down to the big toe. If the cause resides within the lumbar spine itself, then the leg pain is often accompanied by back pain. Limping is often a possibility; however, when an injury occurs this low, movement of the legs can become so encumbered that a wheel chair may also be necessary. Careful diagnosis is needed to determine which spinal nerves are affected. What Are the Causes of Sharp Shooting Hip Pain Running Down Leg?